It’s that time of year again where a lot of us are getting next year’s program off the ground. And if you’re like me, you have a little bit of that impostor syndrome going where you’re wondering, is this the year they finally lose interest? But I’m happy to report so far, so good for me! In the first week since I launched my 2020 model rep campaign I received over 50 applications, up from about 30 at the same time last year! I also already have 20+ meetings scheduled for the middle of January which has me drinking lots of water to prepare for dry mouth! But I’ve still got a ways to go. I’ve averaged 40-50 reps per year for the last 7 or 8 years and I need at least 35 to have a successful season. I’m on pace to get there and super pumped heading into the new year! 1. Year round advertising – Right now my focus is on the 2020 kids, but sometime around March I’ll start advertising for 2021 reps. All I’m doing at that point is trying to build interest and collect email or cell numbers (I ask them which they prefer). My goal with this is to have a list of about 100 kids that I can immediately start marketing to by text or email when I release my info in December! To do this I create ads that lead to a funnel asking for their info. 2. Convert to an Instagram business account – I’d been skeptical about doing this after the way Facebook treated business pages, but I have to tell you I wish I did it a lot earlier! With business accounts you get more analytics which is all well and good, but the best thing in my mind is the ability to boost individual IG posts cheaply! I spent all of 2018 trying to think of ways to get my page in front of new people with very little luck. My account hovered at plus or minus 2000 followers ALL FRICKING YEAR! Now for just a buck or two I can easily get my page in front of new people and I’ve been able to pick up a bunch of new followers in the last couple weeks doing this! 3. Use a squeeze page for your model application – A squeeze page is a type of lead page where viewers only have two options – Fill out the form or leave! Your application should be a squeeze page! Don’t include links to your website or social media pages on your application page!! No links of any kind except maybe an email link in case they want to ask a question. Once they get to the application you want them to fill it out! If they click on a link to your website or Instagram feed who knows if they’ll ever come back. 4. Referral incentives – The day I released my 2020 application I sent a text to each of my 2019 reps and offered them $20 for each 2020 kid they refer who ends up becoming a rep. I also give $100 to the 2019 rep who gets the most referrals. Most of them ignore me because… kids… but there’s always a few who go gangbusters talking the program up and posting links on Instagram. And we all know it only takes a few. I also get current applicants to start thinking about referrals early. There’s a spot on my application for the name of any referrer so I tell all of my applicants to get their friends to sign up and list them as the referrer so they can start earning discounts. I tell them their parents will love them! Again, they don’t all take advantage of this but a few do and that really helps! 5. 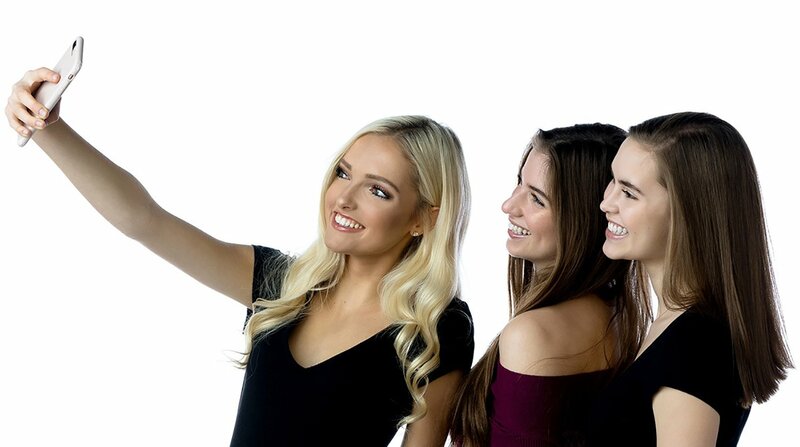 Legacy Reps – This year I found a few 2020 kids who had older sisters that were reps for me and invited them into the studio to take a few photos to create promotional images (like the one in this post). It was easy to do because their parents already knew and trusted me. They had a blast and of course shared photos on their IG pages which really helped get the word out! And having 2020 kids in the ads looking for other 2020 kids has been a real boost! Now if you’ve never run a Rep program and you’re looking to start one up, these things aren’t going to help you get 50 reps this year. But don’t be discouraged! Start planning for next season now! Go out and do whatever you can to get 4 or 5 kids this year and create great images and even more importantly, a great experience! Then start working towards next season and you’ll be amazed how fast you can get your program to grow!